I discovered a different type of seasoning early in my Army days. It was then that I learned to appreciate coffee. A few 4 a.m. wakeups in a row will bring you face to face with the body’s need for caffeine. If the ancient gods used to drink ambrosia, it was only because coffee beans had yet to be ground. Ft. Leonard Wood, Missouri sometime in 1987: A young private yawns after emerging from his bivouac tent. Another soldier, already up and industrious poured his mate a cup and they share a not-so-Hallmark moment before a forced 20-mile march. 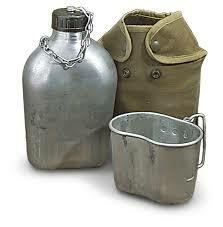 The coffee stinks, made worse by a metal taste of the cup in his canteen set. Always with a twinge of tin, the coffee never got any better for the private. Until he reached his permanent duty station. Ft. Sill, Oklahoma sometime later in 1987: Another bivouac site. Enter a major who happened to catch our private cleaning his cup after chow. “What are you doing, Private?” the Major barked. The officer proudly displayed his aged, filthy, stained tin cup. While the private was someone disgusted by the sight, he noted the old warhorse’s appearance wasn’t much better and yielded to his experience. After a few weeks, his cup had a slight brown discoloration to it and surprisingly, his coffee tasted much less like tin. Flash forward to present. 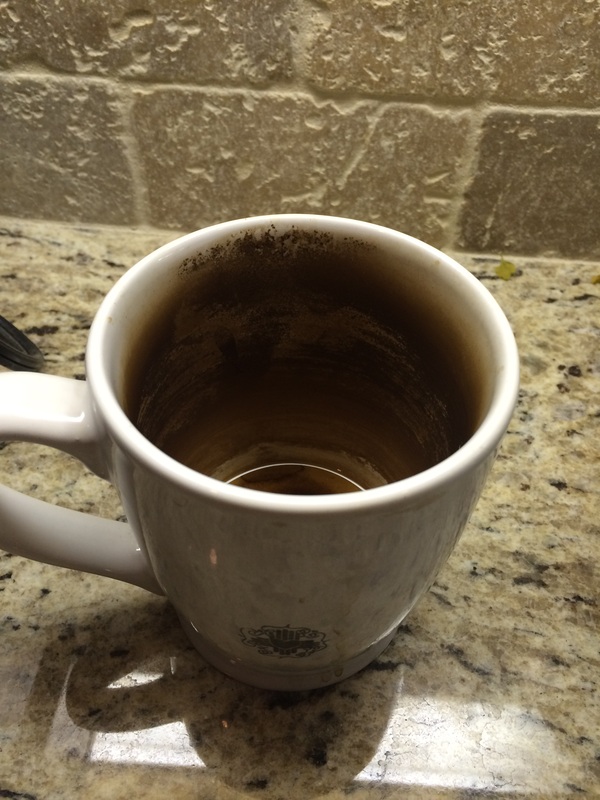 I still don’t wash coffee mugs out. At work, I like to use the same mug for months and develop something like this. Obviously, I’m no germaphobe. I like to think I add yet a third type of seasoning to the people I work with – the crazy variety. Some of my co-workers complain. They steal my mug to clean it and I act mad when it reappears all shiny on my desk. It is totally a mental thing now, or maybe it gives me a hint of nostalgia to remember the good old army days. Most likely, the little brother comes out and I keep my mug stained since it annoys others – once a little brother, always a little brother. In the end, I like being That Guy in the office. And yes, I know ceramic mugs don’t need seasoning. But my eccentricity seems to benefit from it. You were at Ft. Leonard Wood! Used to drive past that exit on Highway 70 on my way to other parts of my old state of Missouri. Seasoned mugs? Ummmm no thanks! Seasoned iron skillets? Oh yeah! I was just a babe of 19. I have no idea where it is in the state! There is something about coffee brewed outdoors too. I am a coffee snob. I only drink freshly ground coffee from beans that were roasted no more than a week ago – but when I go camping, I ladle Folgers grounds out of a gallon tub into a porcelain pot to percolate over the morning fire. Nothing can come close to the taste of that. I’m gonna have to try that. With my seasoned mug, that is. oh, i love this and it makes sense. like a finely seasoned old iron skillet. When people perked their coffee on the eye of a stove in an aluminum coffee percolator, It was customary to NOT wash the pot frequently. We could always tell when someone washed the pot .BTW I still have one of those coffee pots and once a year use it and enjoy the wonderful memoires it evokes. I didn’t know that. Seasoning is everywhere.